The role of communities has been identified as significant in the future success of Ireland’s transition towards a decarbonised energy system. At the community level, there are different understandings of, and attitudes to, sustainability and energy use. This talk argues that current habits of categorising communities’ energy needs by technology experts’ standards creates an Irish energy planning environment oblivious to the distinctive energy needs of island communities. This classification of situated energy knowledges under the rational terms of experts’ or policymakers’ standards distorts and blurs the authenticity of community insights influencing the energy planning process in island communities. Within these peripheral communities, the conventional “one-size-fits-all” national approach to community engagement and public consultation has proved unsuccessful. This talk reports how predominant technical approaches to community energy planning are further marginalising periphery or island communities where, typically, local knowledge is highly valued. These findings were developed through an island-based case study analysis of Inis Oírr Island, in the Aran Islands, in the West of Ireland. This talk further argues that the complex issue of community low carbon energy transitions requires investigation from multiple disciplinary perspectives. The innovative transdisciplinary methodology developed, applied and analysed in this research enabled a holistic investigation of the role of situated energy knowledges and community knowledge networks in successful community low carbon energy transitions. Finally, the research discussed in this talk aims to create new knowledge of the role of situated energy knowledges and community knowledge networks through the application of a transdisciplinary methodology that combines social scientific and engineering techniques to create a holistic picture of appropriate low carbon energy transitions for Inis Oírr island. The transdisciplinary approach developed for this research enabled the participants and the researcher to engage in a co-creative energy planning process where all types of knowledge were given legitimacy and equal respect. This research contributes to a better understanding of pathways to achieving a more inclusive, holistic and co-creative community energy transition process that can better adapt to the atypical energy needs of island communities. 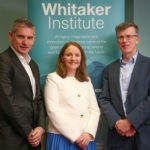 This seminar is one of a series of seminars in the Whitaker Ideas Forum seminar series. Dr Eimear Heaslip will speak on behalf of the Environment, Development & Sustainability research cluster.